Myriorama is the community engagement arts project accompanying the specially commissioned Hope Street Production of Alice Through The Winter Gardens which celebrates the history of Blackpool’s iconic building. Firstly to work with members of Claremont Park Community Centre and members of other community groups across Blackpool in a new and interesting creative process. Secondly for audiences to be made once again curious about the architecture, places and spaces of Blackpool, in particular The Winter Gardens, and to introduce something old, something new and something of artistic and creative merit. Local artist Garth Gratrix was selected by a panel including community members of Claremont Park Community Centre to lead on this project. The origins for Gratrix’s project proposal was to create a piece of art that references the Winter Gardens in its theatricality by constructing a series of eight interchangeable doors to create a Myriorama, a series of images which can be rearranged to create an interchangeable landscape. The finished work will be on display in the Bar Red window from Saturday 19th November. You can meet the artist and the participants at 2pm outside window for an opportunity to talk about the work. 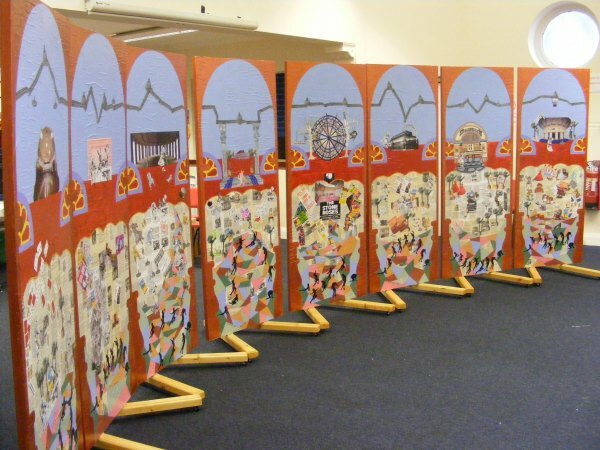 Myriorama is a project produced in collaboration with Hope St Limited, Blackpool Council Arts Service and Claremont Park Community Centre and supported by Arts Council England through an Arts Lottery Award through funding for the Alice Through The Winter Gardens production. This entry was posted in Uncategorized and tagged art, blackpool, culture, empty shop, garth gratrix, myriorama by cultureshops. Bookmark the permalink.